It'll be out this Spring. 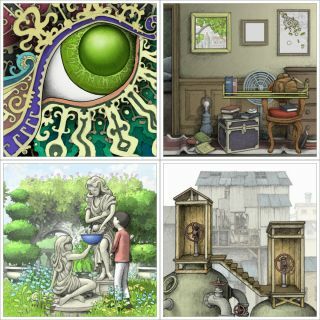 We first looked at beautifully illustrated puzzler Gorogoa back in 2013, a game that, at that point, had a mid-2014 release date. In an alternate universe, perhaps that came to pass, but unfortunately it's now 2017 in The Darkest Timeline and there is no Gorogoa to be found. Thankfully, a release is imminent, and let's hope it actually happens this time, because this year could sure use some more lovely things in it. What is Gorogoa, then? In developer Jason Roberts' own words (or at least, in the words of the person writing his website), it's a game where you "arrange and combine lavishly illustrated panels, each one a separate interactive window into a living game world. Navigate the scene inside each panel. Align the images in adjacent panels. Solve puzzles and advance the story by stacking and connecting panels. Imagine pictures on a wall escaping their frames and joining together to create new impossible scenes".